Apple just released the new version of iOS 11.3 beta today that features the much anticipated Battery Health Status. Access the new setting via Settings > Battery > Battery Health (Beta). When you tap on this setting, it will show you a couple of indicators. First, it indicates the maximum capacity of your iPhone battery. This measure shows you the relative strength of the battery compared to its original ‘new’ state. Lower capacity may also result in fewer hours of usage between charges according to Apple’s description. The second battery status indicator is the ‘Peak Performance Capability.’ This indicator is more of a notification as opposed to a metric. Mainly it shows the status message of your iPhone battery. 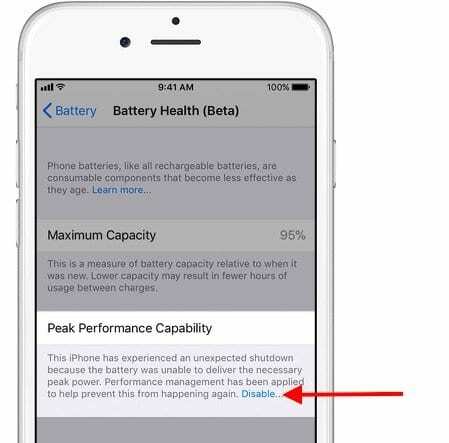 If your battery is in good condition, it will show you the message “Battery Currently supporting normal peak performance.” However, if there is a problem with your iPhone battery, this will change into a different alert suggesting you to replace your iPhone battery. 1.1 Are there better Apps or Features to track iPhone Battery Health? 1.5 Does Slow Charging Work? These new changes in the iOS are a result of the public outcry that we saw when Apple publicly admitted to slowing down older iPhones whose battery performance was not optimal. In the current design, there is no explicit switch setting to “de-throttle.” We are assuming that Apple may have stopped the throttling process altogether and instead added features to make your battery health more transparent. 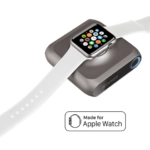 You can read about the updated Apple Battery Health Status document at the Apple site. Unexpected Shutdowns happens when your battery’s health is significantly degraded and thus can’t provide sufficient/required power to the device specially when the battery is low but with iOS 11.3, you can now manage the Power to be consumed by the device which we call as Power Management and if Power Management has been applied to your device, the overall performance of the device gets slower so as to prevent an unexpected shutdown because if the device is not performing at its Peak. Performance, it requires less power from the battery and if the power requirements are less or equal to what a degraded battery can provide, there will be no unexpected shutdowns. An unexpected Shutdown happens when the power required by the device is more then what the battery can provide and if your device is experiencing a lot of unexpected shutdowns or if you feel it somewhat slower then before, then you should get a battery replacement . Apple is officially offering discounted battery replacements for iPhone 6 and later till December 2018. 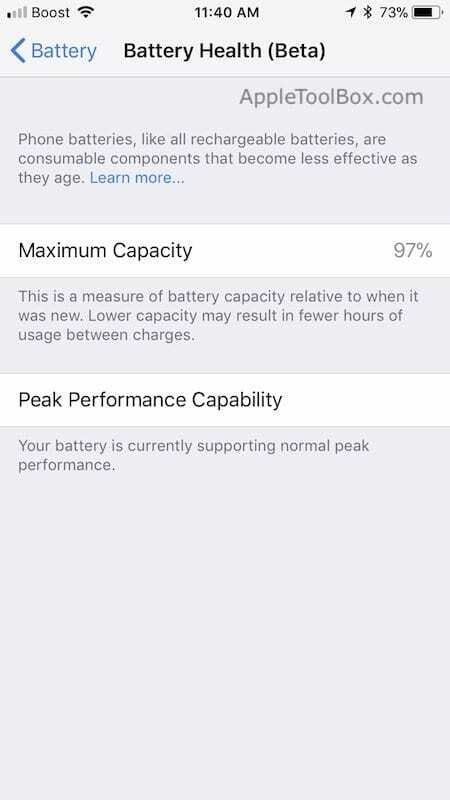 If Power Management has been applied to your device and you want to disable it, you can do so with iOS 11.3 by going to Settings > Battery > Battery Health (Beta) and here below the Peak Performance Capability, you will find a “Disable” option in blue. You will find the disable option only when the Power Management has been applied and Power Management only gets applied when your device experiences an unexpected shutdown and thus if you haven’t experienced an unexpected shutdown even if your battery health is not good or your device is supporting Normal Peak Performance, you won’t find the disable option as there’s no need for that. The best thing to do is to replace the battery of the device if you are seeing the above message. 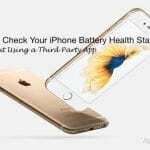 If for some reason, you want to wait a little longer before replacing your battery, you will have to remove some of the battery hogging apps from your iPhone. 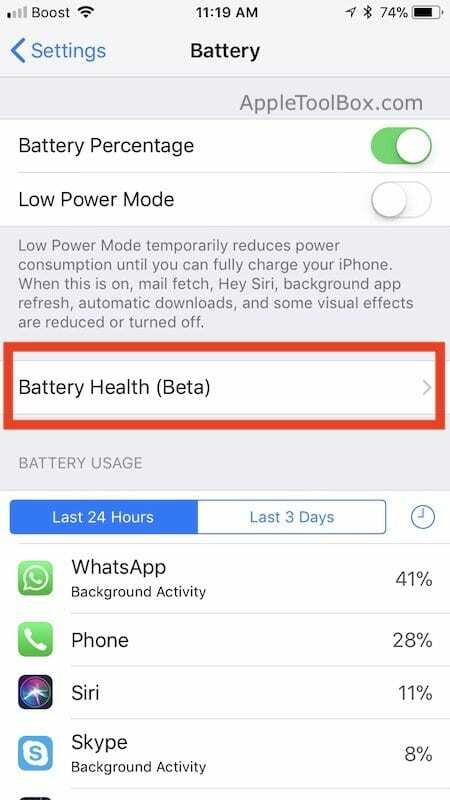 The Battery Health (Beta) feature isn’t available for iPhone 5s and iPads or iPod Touch which are also upgradeable to iOS 11.3. A new battery can easily provide sufficient power to the device so as to make it support Peak Performance while a degraded battery may not be able to provide required power to the device for its Peak Performance and thus you may feel the device somewhat slower even if Apple didn’t throttled them at all. 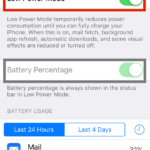 Are there better Apps or Features to track iPhone Battery Health? The Battery Health feature that came with iOS 11.3 is still in Beta and this itself means that the health of the battery it shows isn’t 100% accurate. So you may find it fluctuating between different health percentages and you shouldn’t’ worry about it as long as your perak performance indicator is good. Third party battery apps from the AppStore aren’t accurate either when it comes to determination of Battery Health and this all is happening due to a change that came with iOS 10. With iOS 10, Apple removed some battery specific data from the API which includes Battery Cycles, Battery Instant Amperage, Battery Temperature, Power Adapter Voltage and Power Adapter Wattage. This is currently available only on iOS 9.3.5 and older versions and due to their absence, the data shown isn’t 100% accurate. Apple may try to implement back this battery specific data in future versions of iOS so as to make Battery Health (Beta) feature more accurate. Charge Cycle is basically the number of times you have consumed your 100% Battery. For one, it can take 2-3 Days to complete one Charge Cycle and for someone else, it can be completed in just 1 Day. It necessarily doesn’t mean how many times you have drained your battery from 100 to 0% and then charged it again, it means overall how many times you have consumed your one single charge. As an example, consider a person who charges his device in the morning to 100% and then unplugs it and goes to the Office and uses his device a little bit there and comes back to the home in the evening with still having around 80% of the charge left and then again he starts using the device and when he goes to sleep, his battery is at 67%. For next two days, he maintains the same schedule and at the end of both the days while going back to Sleep, he had the same 67% of charge left. So overall he consumes 33% of the charge per day and in 3 Days he consumes almost 100% of the Charge and this is what a One Cycle Charge is. He completes his One Cycle Charge in every three days and that means every year, he completes around 122 Charge Cycles and according to Battery University, Lithium Ion Batteries will loose 20% of its Total Capacity when they will complete about 400 Charge Cycles. So for the person, it will take more then 3 Years to complete 400 Charge Cycles and thus due to that, his battery will stay healthy for a longer period of time. Now consider another person who regularly drains his battery till it reaches 20-30%. So the person is completing 70-80% of his One Cycle Charge everyday and this means that the person will only take just about 4 Days to complete his 3 Charge Cycles and every year, he completes about 274 Charge Cycles and he will take just about 1 Year and 6 Months to complete 400 Charge Cycles. So for this person, battery will stay healthy for comparatively a shorter time period as compared to the first person. So the wear rate, the rate at which battery will loose its capacity is different for everyone depending on the time taken by one to complete one cycle charge. Every Battery comes with a limited number of Charge Cycles and more faster one consumes these charge cycles, the shorter will be the life of the battery. Also, Calibration of the Battery is counted as One Cycle Charge because in that process you have to drain the battery completely to around 10% or lower and then have to completely charge it till 100%. Avoid it as much as possible and perform a battery calibration only when you find your battery getting stuck at a particular percentage or the percentage is jumping and is not continuous. Now let’s talk about the effects on the battery when it stays plugged in for several more hours even after it has got completely charged. One example of such a case is Overnight Charging. Again there’s no harm here in this case as well because it’s not getting overcharged at all because the rate of flow of charges towards the battery gets comparatively slower when it reaches about 90% and flow of charges finally stops when the battery gets completely charged. While Charging, when it reaches about 90%, the battery enters a mode called Trickle Charging Mode and in this mode, the rate of flow of charges gets slower and as soon as your battery gets completely charged, the current flow comes to a stop. Slow Charging is one of the best friend of your battery as it increases the Charge Storing/Holding Capabilities of the Battery and I personally have observed so many times that whenever I charge my iPhone through one of the USB Slots on my computer which have an output of about 0.5A, my battery lasts a bit longer. Also you necessarily don’t have to completely charge your phone everytime you plug it in and it will be better if you will unplug it as soon as it reaches around 90%. In this way the battery will stay healthy. 1. Turn Off Background App Refresh. When this is enabled, apps running in the background refresh their contents, update your location, and do other data intensive transfers which drains battery. 2. Turn Off Wifi and Bluetooth when not in use. When these are enabled even when you are not using them, your device constantly keep looking for possible connections which drains a lot of battery. 3. Set Location Services to “While Using the App”. When Location Services are enabled and are set to “While Using the App” for all your apps, Apps will use Location Services only when you are using them and their will be no background activity which will save your battery. 4. Turn On Auto Brightness. Most of us have an habit of using the device at maximum brightness and at maximum brightness, your screen draws more than 80% of your phone’s power. So Turning On Auto Brightness will automatically set the brightness level to what’s required. 5. Turn Off Facebook Autoplay. This can be the one of the most power intensive features on your phone and can drain your battery a lot quicker. 6. Turn On Reduce Motion. The animation effects on your iPhone looks pretty cool but is a battery drainer. 7. Turn On Low Power Mode. Once Low Power Mode is enabled, mail fetch, automatic downloads and some visual effects are reduced or disabled which saves battery. 8. Avoid using your device at extreme temperatures as explained above as the battery is not made to work in extreme temperatures and they have a significant affect on the life of the battery. 9. Do not let your battery drain regularly to 30% or Lower as explained above as you will be completing your Charge Cycles more earlier then expected and which will shorten the life of the battery. We hope this article provided you some guidance around the various Battery health check features that are available to you. 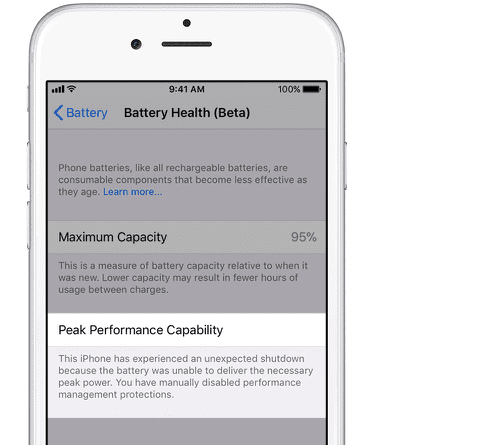 We will update this article as we find additional information from Apple over the next few months regarding improvements to Battery health status.